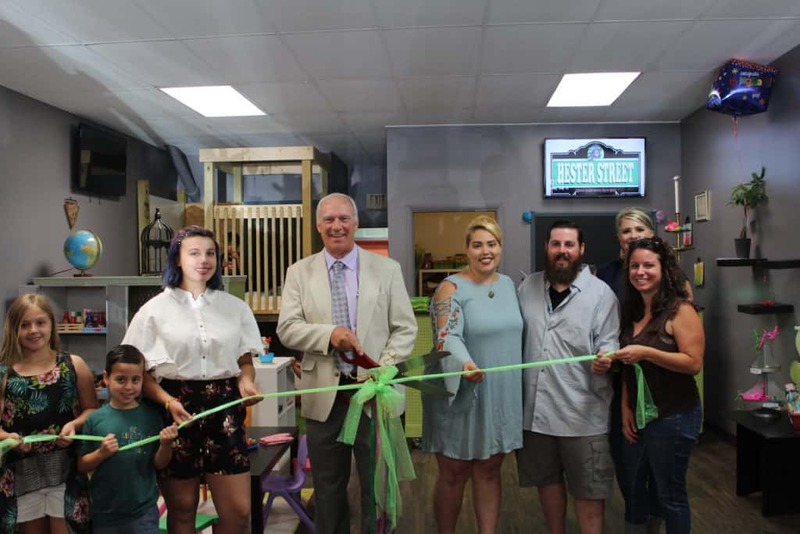 MORRIS – The Grundy County Chamber of Commerce & Industry recently held a ribbon cutting celebrating the grand opening on Hester Street – a family venue in downtown Morris. The family-owned business opened its doors July 13 at 802 Liberty Street, Unit A, in Morris. Christina and Michael Hester are offering a location for imaginary play and crafting for children along with a relaxing environment for parents to enjoy and craft as well. “Every age should let their imaginations run wild,” Christina Hester said in a news release. This unique business is open Monday through Saturday from 10 a.m. to 4 p.m. and specializes in creativity and toys. “Hester Street’s grand opening had a great turnout and was so much fun. They are offering a place for hands-on activities that make both children and adults’ imaginations thrive. Christina and Michael are really giving this community something special for all families to enjoy,” Chamber Executive Director Christina Van Yperen said. The Hester Family joined the Chamber to help grow their business and increase their reach in the community. Hester Street holds classes at the venue, as well as walk-in crafts. Registration for events and more information can be found on the Hester Street Facebook page. For more information on Hester Street call 815-999-1794 or visit grundychamber.com.